After today’s discussion of blog rolls, here’s a good example of why some blogs stay on the blog roll and some do not. Liberty Papers is running this video with a comment giving the impression that this represents the position of liberal Democrats. I’ve previously criticized on Rangel’s proposal to restore the draft. The proposal was opposed by the Democratic leadership and most House Democrats (as well as Republicans). Even the military is opposed to a draft. Rangel proposed the draft to make a point, and subsequently urged his fellow members of Congress to vote against it. The draft lost by a vote of 402 to 2, with only Murtha and Stark voting for it. The support of two members of Congress, including a conservative member such as Murtha, hardly suggests that this is the position of liberal Democrats. Besides Liberty Papers, the false claim that liberal Democrats support the draft is being spread by Eric Dondero, the far right winger who opposes basic civil liberties while claiming to be a libertarian. Those who have followed the comments to recent posts know him well! Ultimately this is another example of what we see so often. Faced with being wrong on the issues, right wingers like Dondero must fall back on distorting the views of their opponents rather than engaging in an honest debate on the issues. The past six years have felt like a Star Trek episode where one thing in history is made to occur differently than intended, and the whole timeline is changed in terrible ways. In The City on the Edge of Forever, one seemingly small change led to the Nazis winning World War II and the entire Galaxy was different until the timeline was restored. At times it feels like George Bush becoming President is an anomaly which has changed our timeline for the worse. Some of the sentiment for a Gore run could be seen as buyer’s remorse, or perhaps as a feeling that this is how we set the time lineback to how it was meant to be. When Al Gore guest hosted Saturday Night Live he gave a humorous look at how things could have been different (transcript here). FireDogLake presents a scenario of what could have happened if Sandra Day O’Connor had predicted the consequences of George Bush taking office and had voted to allow the Florida recounts to continue. While overly optimistic in some areas, there is no doubt the country and the world would have been much better off. They are Cylons. No, this will not be a “Dallas” dream episode where you wake up and go, “We’re not Cylons!” Without getting into any kind of spoiler territory, we will be exploring what that means as we go into Season Four, but they are Cylons. So, harbor no hopes that it’s some kind of dream or nightmare. When we do something like this, first of all, it’s not without considerable thought and planning, and second of all, we don’t do it so that we can pull the rug out from under the audience and say, “We were kidding.” Not with this one anyway. That was a culmination of something that Ron Moore really wanted to do. The entire idea of the trial of Baltar was to explore the concept of guilt or innocence within the fleet, and also to suggest that this is a fleet that only had an ad hoc justice system. We’ve never really seen the justice system in the fleet, and I think internally we always assume that the captains of each ship always dealt with whatever issues came up on a summary basis. So we were interested in just trying to explore how you create justice in this world. The second question, which is the one that Lee attacks in his speech, is “What is justice?” What does that mean in this particular world, where we’ve basically been reduced to 38,000 people and vengeance and attempts to get retribution for things in the past might not be as valid as they would, say, in a different circumstance. It was also fascinating, I think, that Baltar was the elected president of the 12 colonies and found himself in an untenable position. Lee’s speech was an attempt to address the practical realities of the situation that they found themselves in, and pull us out a little bit from us screaming for blood. That’s where the impulse for that came from. And again, one of the great things about working on a show that has such a rich background as “Battlestar” is that you’re able to pull from a lot of events that happened in past shows to demonstrate how the fleet’s justice system or sense of justice has been tested or not tested, or how forgiveness has been the rule of the day. I don’t know if the goal is in sight, but certainly the goal of the fleet is to find Earth. That [shot] was a really wonderful sort of wish of the fleet, to be there. That’s how you can take that. You’ve seen Earth. What Earth is and what it might be is stuff that’s still up in the air, but the goal of the fleet is still to find Earth. Obviously, we’re going to be exploring that. When Kara comes back and says something like that, it’s not a thread that will be dropped. Let me just put it that way. I thought the uproar had quieted down, but talk of blog roll purges continues in the blogosphere, such as at The Republic of T and NewsHog. Many bloggers are concerned that the bigger, A List bloggers tend to link only to themselves, and therefore keep the blog traffic (and ad revenue) to themselves. They fear that whether they have links on the A List blogs will determine the amount of traffic they receive.Listings on blog rolls are easy and cost nothing, so I will freely exchange them with most blogs within reason, but they are far from the most major source for readers. A listing on a huge blog such as Daily Kos might bring in more traffic than I usually receive, but for the most part I fear that the odds of receiving many readers off of a long list of blog names isn’t that great. Again, that’s not to say I don’t appreciate it. Even if I only get a handful of hits from a particular blog, some people will return regularly, and perhaps recommend the blog to still others. I did go ahead and add The Repubic of T and NewsHog to the blog roll here in the hopes they will reciprocate. Besides the actual blog rolls, a link to a specific post on an A List blog can bring in a flood of traffic for a couple of days. While generally less effective than being linked in a post, track backs and comments with a link will often bring in readers who are interested in a topic discussed on another blog. There are also many sources for readers beyond the A List blogs. There are far more B and C List blogs, and their total readership exceeds that of the A List political blogs. There is also a huge blogosphere beyond the politcal blogs, and many of the readers here come from science blogs and blogs dealing with the arts or entertainment. This is increased somewhat by having a number of entertainment posts here, but often nonpolitical sites will drift into politics and link here. Besides blog rolls, there are many other sources of traffic. Blog aggregators will often include posts from Liberal Values, even if they are ignored most of the A List blogs. Many hits come from links in discussion forums, which can generate significant traffic even if they are ignored by Technorati. Perhaps the most interesting link was after I had this post on a cancer society refusing money from strippers. Following the links back I found a link to the post on a forum for professional strippers. Google and other search engines are also responsible for several hundred additional hits here per day. Google seems to love blogs since they are update frequently. While bloggers can obsess over their stat counters, I no longer even see them as the best measure of success. It might be different for the larger blogs which get thousands of visitors per day, but for myself I believe that the subscribers through RSS feeds is a more meaningful measure of readership. Liberal Values recently broke 2000 readers per day through Feedburner. This isn’t an exact number as some probably read the site through the original RSS feed before I joined Feedburner, and Feedburner doesn’t count all RSS readers, but knowing that over 2000 people may be reading this in their RSS reader, on top of hundreds more per the stat counters, is more important than whether I’m listed on a blog roll. As I noted recently, flip flopping has become a major problem for the three major GOP candidates. Rudy Giuliani has come under attack for yet another flip flop. In 1996 Giiuliani said that the flat tax “would be a terrible mistake for urban areas.” Now that he has the support of Steve Forbes he is considering it. In recent years Republicans have portrayed flip flopping as the greatest evil, and then distorted statements from Democrats to create false impressions of a change in views. In John Kerry’s case, most of the charges of flip flopping were total fabrications of the right wing noise machine. His views on issues such as the Iraq war were totally consistent if you look at his actual views as opposed to the distortions presented by the right wing media. Of course there were a couple of areas in which Kerry did change his mind. As terrorism became a greater concern, he changed his views on the death penalty to allow for the execution of terrorists. After NAFTA was in effect he supported analyzing the effects and possibly revising the policy. These seemed quite reasonable changes in opinion. In the case of the Republican flip flops, some are more reasonable than others. Romney’s change from a social liberal when running in Massachusetts to a social conservative when running for the GOP nomination appears politically motivated as opposed to a true change in views. However sometimes it makes sense to reconsider a position one has taken. It might take time to accept a radical change in how things are done. In consideration of this, I’m willing to give Giuliani a pass on the flat tax. If the goal is to have a tax plan which brings in the most revenue with the least pain, as opposed to simply soaking the rich, the flat tax might be worth considering. The complexity of the tax laws adds thousands of dollars in business expenses to my office which might be eliminated if the tax code wasn’t so complicated. A fortune is spent every year on tax shelters, reducing the pool of taxable money. There are potential good points to a flat tax but I also look at it with some skepticism, wondering if it isn’t yet another scheme to get lower taxes for the wealthy while exaggerating the benefits. To really evaluate the flat tax we need good information on what rate would be necessary in order to raise current levels of revenue without creating increased hardship for those with lower incomes. A problem with obtaining an analysis of this type is that political biases enter into the equation. Having Rudy Giuliani back the flat tax makes it more of a possibility than when Steve Forbes ran while backing the change. Perhaps this will lead to a more objective evaluation so that we could decide once and for all if this is really a good idea. Doctor Who might be between seasons, but there are still clips available. In this 1995 clip the TARDIS crew comes back from the future to see The Beatles perform. One girl from the future mentions that she’s heard of the Beatles and has even visited their memorial in Liverpool. She is surprised that they performed “classical music.” It would have been really eerie if she had made reference to the Beatles splitting up, or John Lennon getting shot. Doctor Who dominates the Hugo Award nominations for Dramatic Presentation, Short Form. The show received nominations for Army of Ghosts and Doomsday, Girl in the Fireplace, and for School Reunion. Battlestar Galactica received a nomination for Downloaded, and Stargate SG-1 received a nomination for 200. The nominees for Dramatic Presentation, Long Form are Children of Men, Pirates of the Caribbean: Dead Man’s Chest, The Prestige, A Scanner Darkly, and V for Vendetta. The nominees for best novels are Eifelheim by Michael Flynn, His Majesty’s Dragon by Naomi Novik, Glasshouse by Charles Stross, Rainbows End by Vernor Vinge, and Blindsight by Peter Watts. Doctor Who has been renewed for a fourth season, but it has not been announced whether David Tennant will return. The third season starts on BBC One on March 31, with Freema Agyeman as the Doctor’s new companion, Martha Jones, to replace Billie Piper (Rose). The role of companion became more significant with Rose. While much of The Doctor’s backstory was no longer meaningful with the death of the other Timelords, Rose became the first companion to have a real life shown beyond traveling with The Doctor. The replacement of Rose with Martha Jones could provide for a new situations if they utilize Martha in a similar manner. There is no word as to when the fourth season will be aired in the United States, but the first episode should be available for download using bit torrent by later this weekend. The first rocket launch to memorialize James Doohan by taking a portion of his cremated remains into space has been set for Saturday, April 28, in New Mexico, with a public memorial planned for the day prior. The memorial service will be held at the New Mexico Museum of Space History in Alamogordo on Friday, April 27. The Saturday launch will take place at New Mexico’s new “Spaceport America” location adjacent to the White Sands Missile Range. A specific time of day has not yet been set for either event. Both the memorial and viewing of the launch will be open to the general public. Doohan’s widow, Wende, will be present at both events, and other special guests may be announced later. 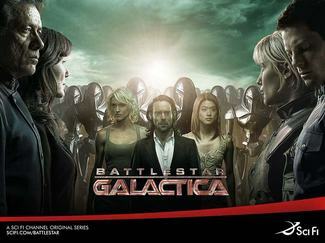 The Battlestar Galactica third season DVD is expected to be released in August. There have been three posts earlier this week on Battlestar Galactica which include information from Ron Moore regarding some of the mysteries left in the season finale. The post-finale posts on BSG are here, here, and here. Lost might be joining shows such as Battlestar Galactica and 24 next season in showing all episodes in a single block following the holidays. This week’s episode featured more needless destruction, but this time we can’t blame Locke. We find that the Others aren’t necessarily the most despicable characters now that we have the full story on Paulo and Nikki. The flashback shows that they poisoned the director of a show Nikki guest stared on in order to steal diamonds from him. Most of the flash backs actually occur after crash. The moment that Nikki mentioned that those spiders will paralyze their victims the outcome with the two winding up buried alive was obvious. It was bad enough that Nikki didn’t account for the possibility of being bitten by the spider which bit Paulo. At very least she should have recalled being told that the spider would attract others. Incidentally, that junior high science teacher was quite an expert on very rare species. If only he had been smart enough not to blow himself up. Seeing what worthless scoundrels the two were made it easy to accept their fate. Paulo certainly had no interest in anything beyond the diamonds. Things might have turned out quite differently for several characters if only he told someone else about the conversation he overheard about how the Others planned to use Michael to capture Jack. The one surprising act of needless destruction was burying the diamonds along with Nikki and Paulo. They could come in handy if ever rescued, and might even be of value in negotiating with the Others. This was also the second recent episode in which the flashbacks were used differently from the usual scenario of showing a character before they came to the island. This week the flashback took place primarily on the island, A few weeks ago the flashbacks of Desmond were also handled differently. As they are not stuck with the format of always using true flashbacks to the past, I’ve wondered if, in the final season, they might substitute views of the characters after leaving the island instead of flashbacks. This way they could both end the series with a rescue, while also answering questions about what happens to the characters when they return home, with many having left at critical points in their life. My wish of two weeks ago for Seventh Heaven to be put out of its misery has been fulfiled as word is now out that the show is to be cancelled. I bet there is no last minute reprieve this season. The fate of Veronica Mars is still up in the air with many expecting them to skip forward and show Veronica training to work for the FBI if the show returns next year. Checking the stat counters, I found that the picture of Kristin Bell in SciFi Friday from two weeks ago is beating search engine hits here for Britney Spears, which I guess shouldn’t be surprising considering that Bell has been named #11 on Maxim’s Hot 100 of 2006 list. I imagine her photos in Maxim were to get her fans prepared for her bathtub scene in Pulse. While it isn’t official, Slice of SciFi quotes David Duchovny as saying that he and Gillian Anderson are in the final negotiations to star in a second X-Files movie. There is no script yet, but reportedly the plan is for it to be a stand-alone story and not part of the alien mythology. It would be easier to write such a story, especially considering how convoluted the mythology stories became, but I think there would be far more interest in seeing what happens after the first movie ended with warnings of an alien invasion to come. While the former mayor of the nation’s largest city was widely lionized for his post-9/11 leadership — “Churchillian” was one adjective, “America’s mayor” Oprah Winfrey’s assessment — city firefighters and their families are renewing their attacks on him for his performance before and after the terrorist attack. “If Rudolph Giuliani was running on anything but 9/11, I would not speak out,” said Sally Regenhard, whose firefighter son was among the 343 FDNY members killed in the terrorist attack. “If he ran on cleaning up Times Square, getting rid of squeegee men, lowering crime — that’s indisputable. “But when he runs on 9/11, I want the American people to know he was part of the problem.